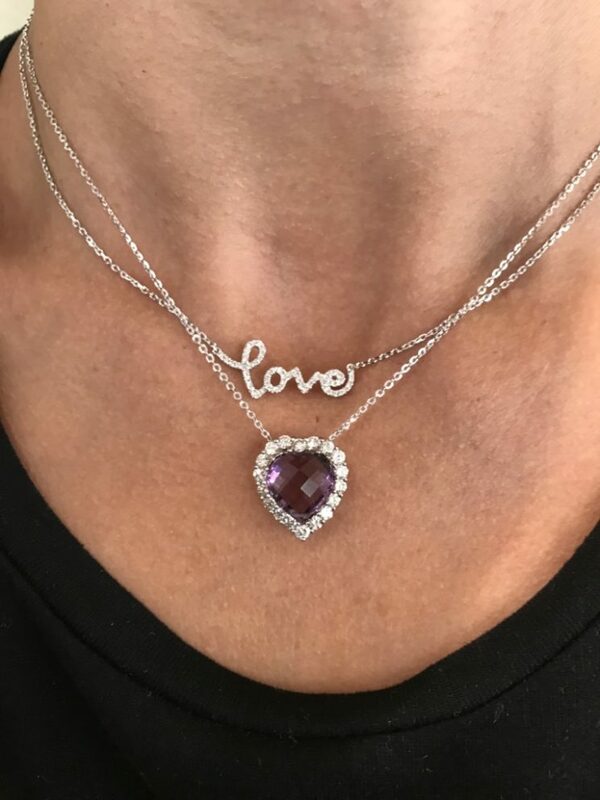 This beautiful amethyst heart surrounded by diamonds is the prefect representative of love. It is the birth stone of the month of February the month in which Valentines Day falls. Translated from Greek, the meaning of amethyst is “not drunken.” An ancient Greek myth explains that, the god Bacchus was angry, and had vowed to set tigers on the first person who crossed his path. Amethyst was on her way to give thanks at the shrine of the god Diana, when she came across Bacchus. Before the tigers could harm Amethyst, she was saved by Diana, who turned her into a clear crystal. Bacchus, remorseful for the fate he had so carelessly caused the girl, poured the juice of grapes over the stone as an offering, therefore bestowing the crystal with its unique purple colour. The greeks believed that wearing the amethyst crysta, would limit the effects of intoxication . In Chinese Feng Shui, properties of amethyst are not of sobriety, but of wealth and prosperity. On a technical note looking at the THE MOH SCALE OF MINERAL HARDNESS which ranks the scratch resistance of various minerals from harder to softer material from 1-10 (diamond being 10) amethyst sits at a comfortable 7. It is a durable stone its lavender to violet shade is the result of iron and aluminium deposits, as well as natural irradiation. It is worth noting that Amethyst can range in colour from transparent to deep purple being the most famous and valuable. There are also pink and green variations which are extremely pleasing.